Here are the microsteps she uses everyday to recharge with meditation. Agapi, who works with her sister Arianna Huffington at Thrive Global, emphasizes that meditation doesn’t take any particular skill or training — she says that if you can breathe, you can meditate. To meditate, sit or lie in a comfortable position and focus on your breath: what it feels like, and how your belly, lungs, and chest move when you inhale and exhale. Whenever your mind wanders, just return to thinking about your breath. “It’s about taking in the incredible gift of your breath. If you drop into your heart, you don’t have to worry about your mind,” Agapi says. Mindful meditation is accessible to everyone, although if you’ve never tried it before, you may prefer to get into it slowly, by taking microsteps. Agapi has implemented the idea of microsteps (teaching people to change their behavior by making small, incremental changes) into her training. 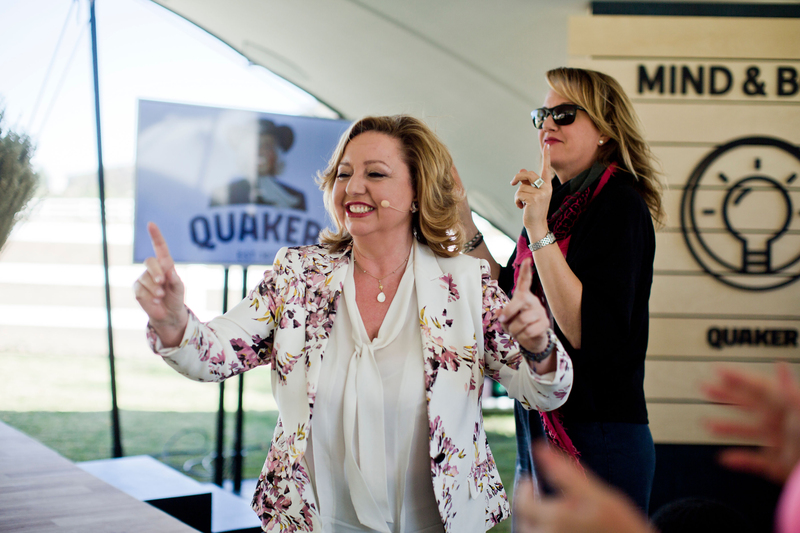 At her meditation workshop at the Quaker Rise & Thrive festival, Agapi shared some of her best microsteps for making meditation a part of your routine right away. You can meditate whenever you want to. You’re never too old to meditate. You’re not too old to breathe, so you’re not too old to meditate. “Meditation is just another adventure in your life that energizes and enhances you. It gives you that extra muscle to really be able to face adversities and challenges in your life,” Agapi says. You don’t need to always be on. It’s impossible to always be on — you need a chance to recharge. Meditation can provide you with that opportunity, especially if you use it as part of an evening wind-down routine, and give yourself time to focus on yourself and your breath, and keep focus off of your devices. “Make sure that when you disconnect at night, you really disconnect,” Agapi suggests. Read more about redefining what it means to age in our special section Second Acts, brought you by Quaker.